Joe Pesci is a New Jersey actor who starred in Goodfellows, Casino, My Cousin Vinny and countless other major films. 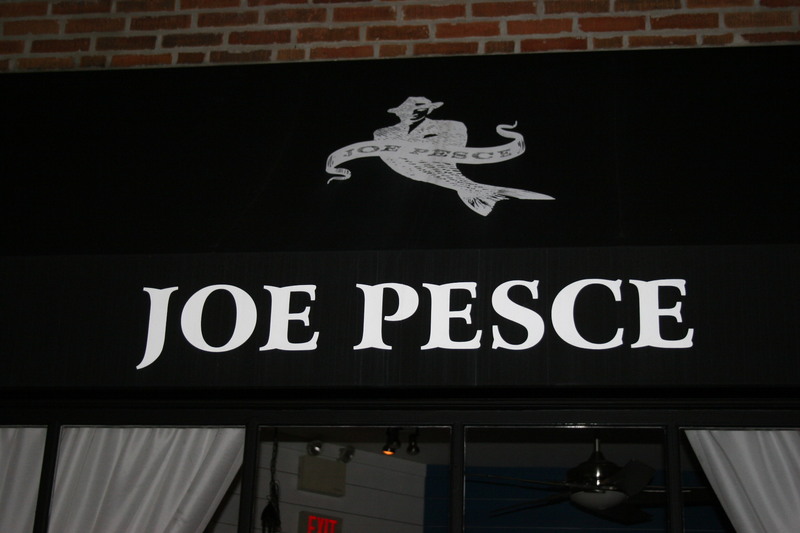 Joe Pesce is a restaurant in Collingswood. There is no connection between the two. 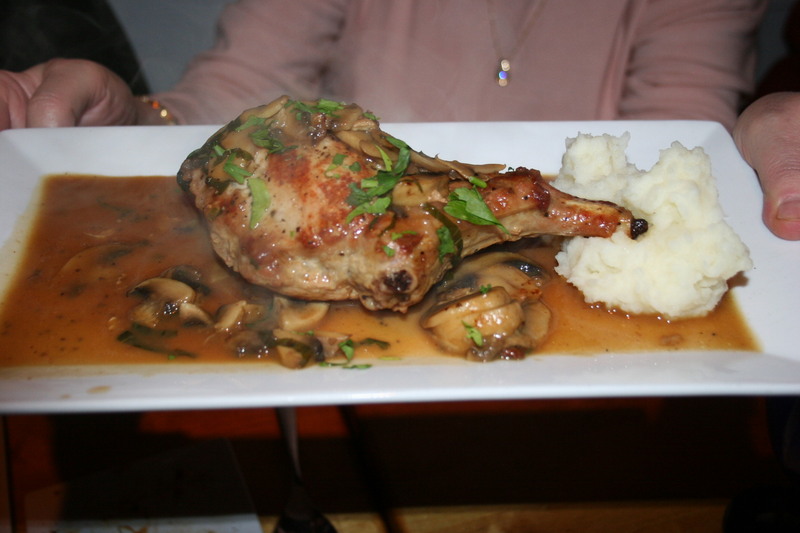 Six of us ventured into Collingswood for a visit to this restaurant last Saturday night. We had been there before but it has been a couple of years and we have not been there during the life of my blog. Aubrey, our server for the evening, had a great smile and she provided capable and attentive service throughout the meal, despite trying to avoid having her picture taken. My wine this evening came recommended by my Wine Guru friend, Vladi, who can be found most days and evenings prowling the well-stocked aisles at Wine Works on Rt. 70 in Marlton, NJ. 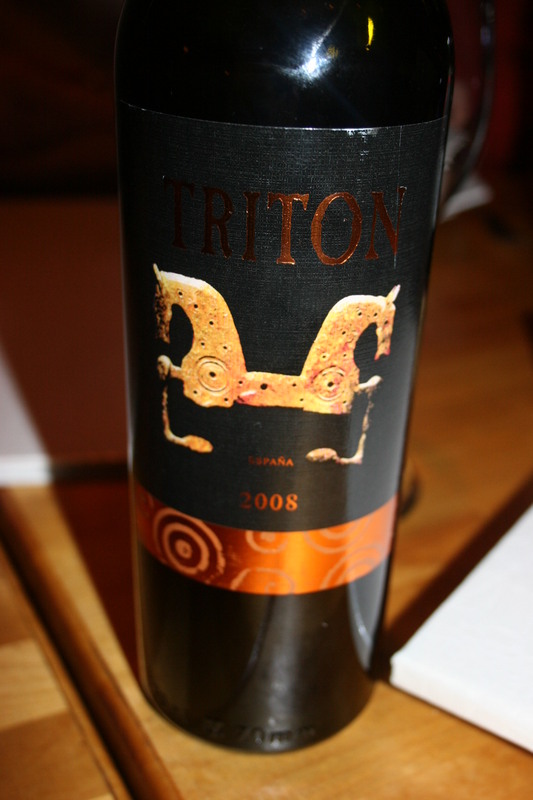 This one was the 2008 Triton Zamora Tempranillo, Spain. This one had a very distinctive flavor of crushed berries and exotic spices. I thought it was good value for the money (mid-teens) but, as usual, my wife, although she enjoyed it, knew exactly where the price point for this wine was located. At any rate, a nice wine that went well with our food. 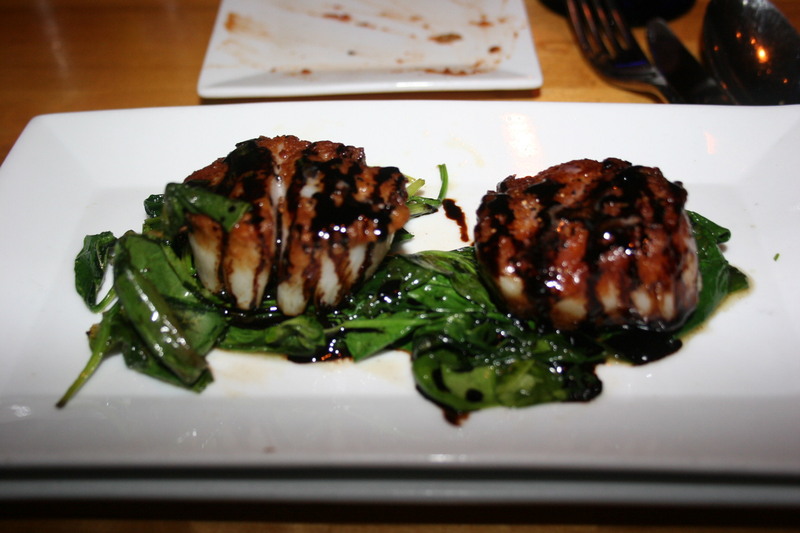 Jerry started his meal with the Seared Scallops served over a bed of sauteed spinach and drizzled with a balsamic reduction. The scallops were done just right and the sauce added just the right tangy flavor to the delicate scallops. 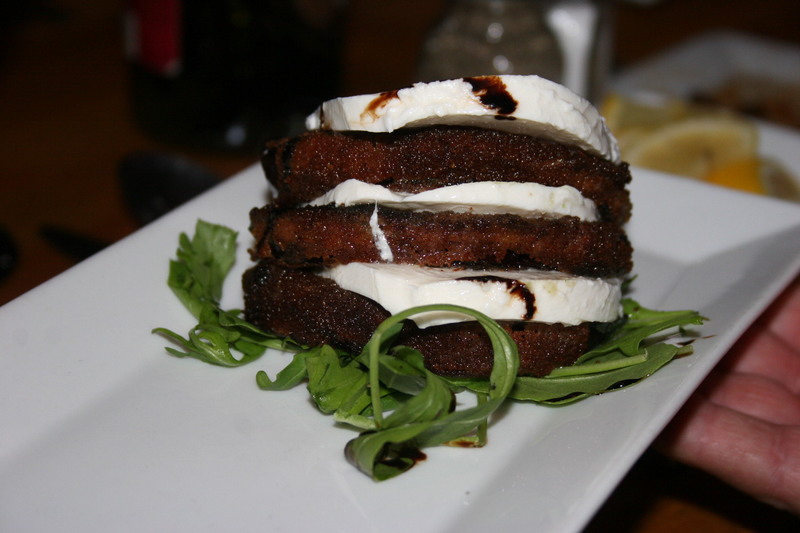 A couple of the ladies went with the Eggplant Caprese which featured slices of fried eggplant between sections of creamy mozzarella cheese. They reported that the cheese was very good but the eggplant was a little bland. I had no trouble at all choosing my appetizer. 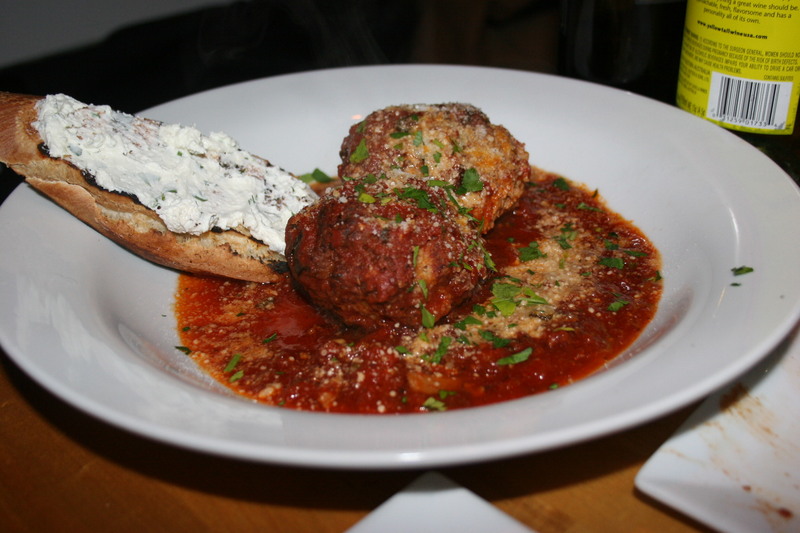 It’s not often I get to have meatballs as an appetizer so when I spotted Joy’s Meatballs on the menu, I knew I would be trying them. Two nice sized spheres of beef, veal and pork were accompanied by a nice toasted crostini smeared with buttery cheese. The meatballs were in a tasty marinara sauce and I was delighted with my starter. There were a couple of interesting fish “specials” on the menu on this particular night and I was torn between the salmon and the red snapper. When Jerry chose the salmon and Joe selected the red snapper, I was more confused than ever. I decided to go with the salmon and I ended up quite happy with my choice. 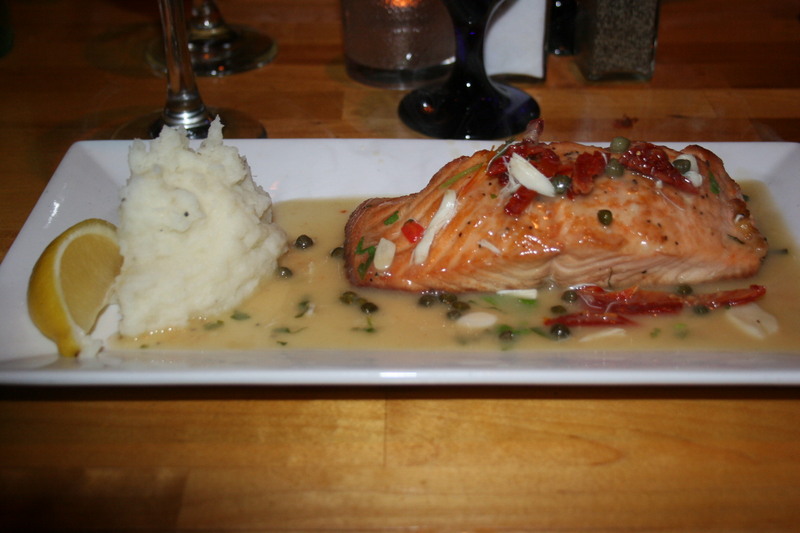 This was a pan-seared salmon stuffed with crab imperial and served in a scampi sauce of lemon butter, white wine, capers and sun-dried tomatoes. The fish was cooked to perfection, flaky and tender, the sauce was delicate and the side of potatoes made for a wonderful meal. 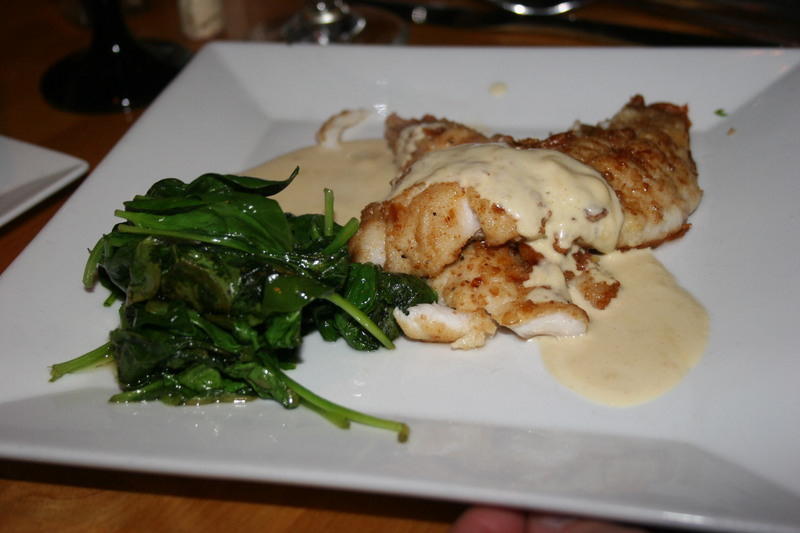 Joe’s red snapper was pretzel encrusted and served with a honey dijon sauce. The dish came with a side of broccoli rabe. It looked very good. Joe mentioned just a slight hint of the pretzel flavored coating and overall, I think I made a better selection in choosing the salmon though Joe certainly had no complaints. 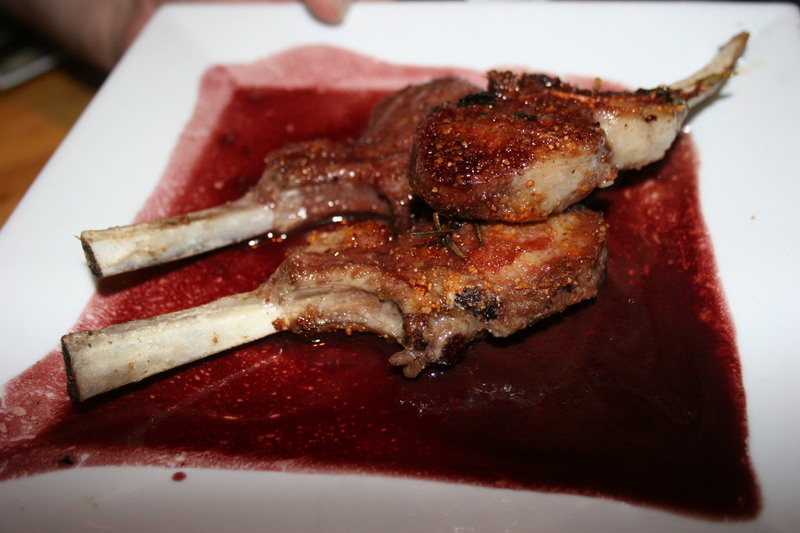 Sue went with an unusual choice for her, the lamb chops, while Kathy countered with a veal dish. 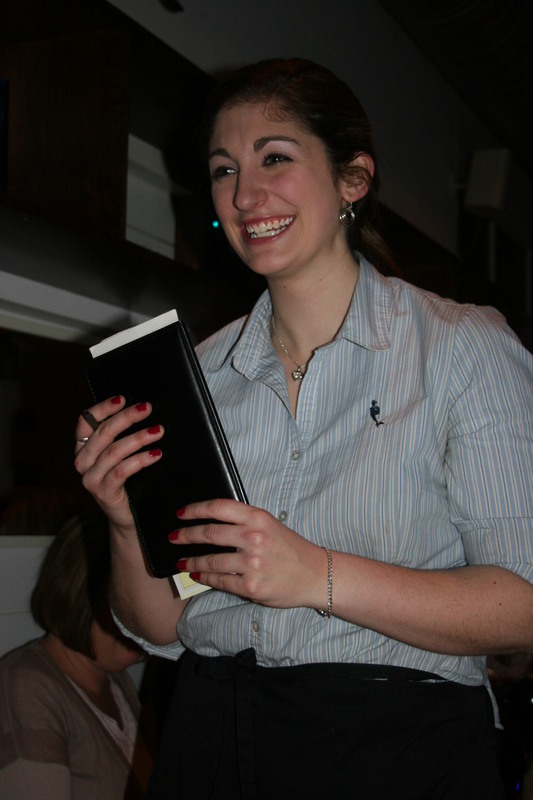 Both items looked good and the women seemed pleased with their dinners. The same could NOT be said for Carol. Her dish sounded delicious. 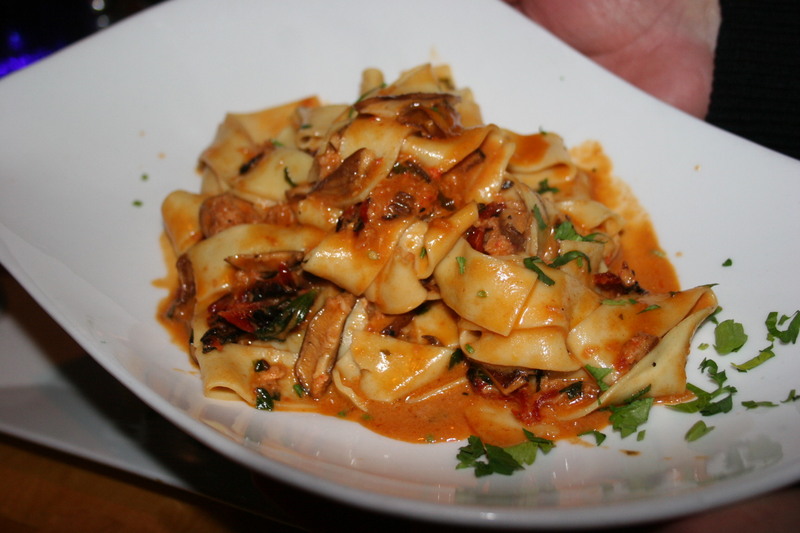 It was the Papardelle Aragosta. Fresh flat noodle pasta with chunks of lobster. When the dish was presented Carol began an ardent search for the elusive crustacean. She did find a small claw and some shreds of the succulent shellfish. She thought there surely must be more hidden away beneath the pasta. Rather than hire a private invesigator skilled in finding missing persons (or, in this case, absent lobster), she asked Aubrey to bring the dish back and add more lobster which she did. It still didn’t bring the dish up to par for Carol as even with the additional lobster pieces she found the sauce bland. 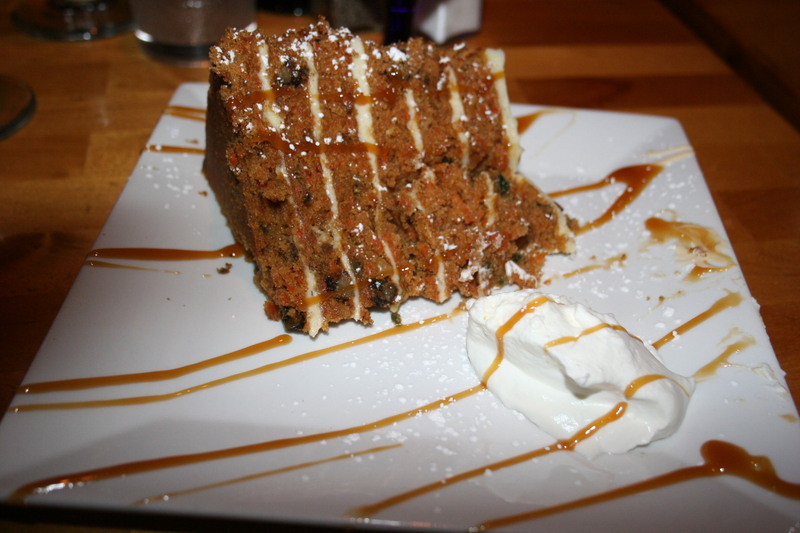 Everyone agreed that all three of our desserts were first-rate. 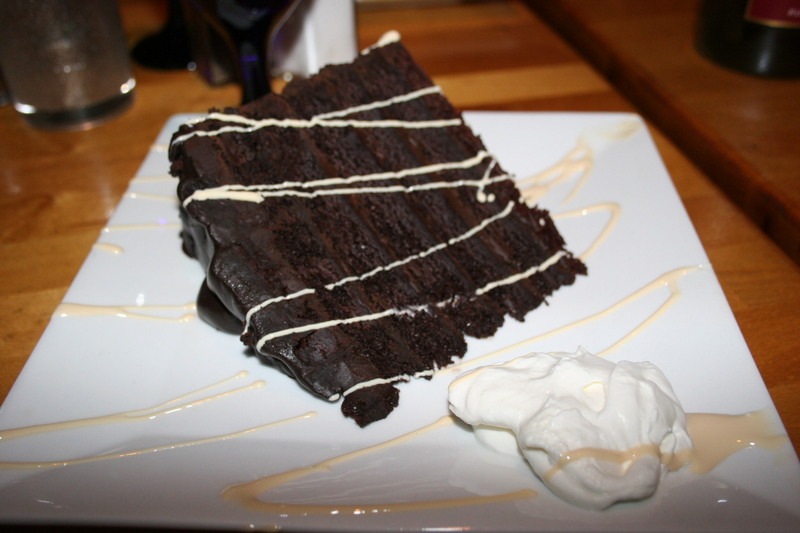 The Chocolate Cake was excellent. 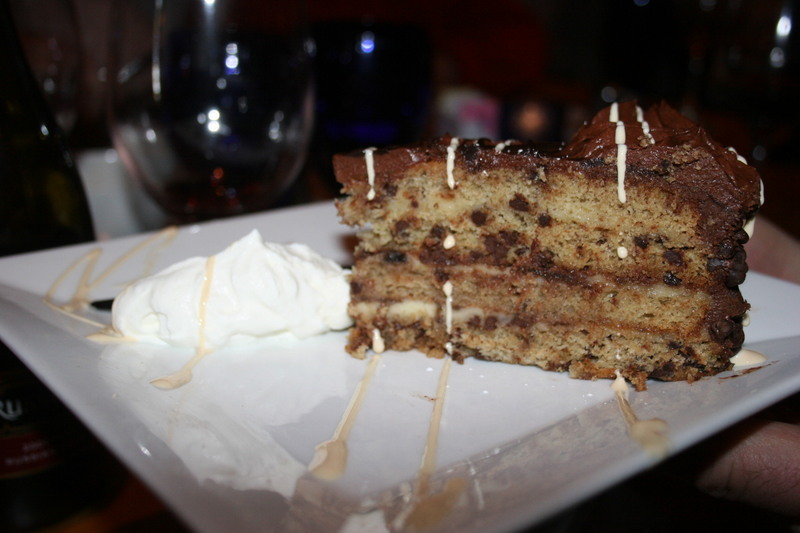 The Chocolate Chip Banana Cake was pretty special and the seven layer Carrot Cake was as good as you would hope. Each of these treats, which we passed around the table, was the perfect ending to the meal.